The fundamental (and only of its kind) history of world animation -Cartoons: One Hundred Years of Cinema Animation (1994), by Gianalberto Bendazzi, defines Todor Dinov as The Patriarch of Bulgarian animation. 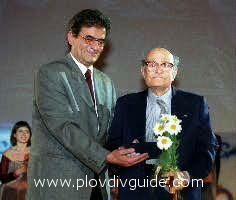 Todor Dinov was born in 1919 in Plovdiv. He was an author, director and script-writer of more than 40 cartoon films and several feature films (for instance The Icon-stand, together with his co-script-writer, Hristo Hristov). He was also populat as a caricature artist, illustrator, graphic artist, painter and placard artist. He founded the first Bulgarian Animation Studio, as well as the Animation Department (now a separate Major) at the Theatre and Film Arts Institute. Member of the Bulgarian Academy of Sciences. In 1999 he was awarded with the Bulgarian highest-rank medal - the Stara Planina order (First Degree), and in 2003 he received the Crystal Pyramide Award of the Bulgarian Film Maker Union for life achievement in Bulgarian animation art. He died in June 2004 at the age of 85.